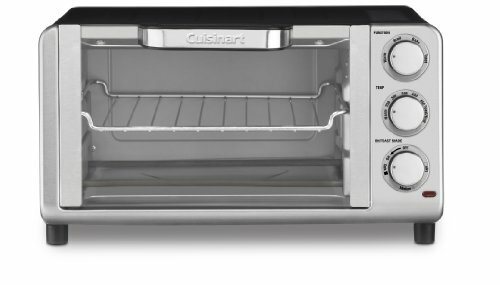 Cuisinart TOB-80 Compact Toaster Oven Broiler is a model designed for small kitchen/counter space. Like TOB-40, it’s made of stainless steel, comes with a limited 3-year warranty, and can actually perform four main functions. Make that clear because some E-commerce sites claim it has 7 functions while Cuisinart official site doesn’t. These functions are broiling, toasting, baking and keeping food warm. The good thing about this oven broiler is that although it is compact in size, it is roomy from inside and can hold 4 slices of bread and even a 9” pizza. If you need a toaster oven that can handle an entire full size pizza or an 18 lb turkey, this, or any toaster oven containing the words “COMPACT” in the title, is not the one for you. Compact Size and Counter-Friendly – Cuisinart TOB-80 Compact Toaster Oven Broiler is small in size and is easy to put anywhere on a counter with a capacity of 0.35 cubic foot. It weighs only 4.6 pounds and its actual dimensions are 14.5″ x 13.1″ x 8.2″. Easy Cleanup – The interior of this appliance is non-stick and easy to clean with an auto slide-out rack and removable crumb tray, which could save you a lot of time. Shade Control – This oven comes with a toast shade control dial as a timer (Light/Medium/Dark). However it doesn’t have minute options, which is complained by many users. Accessories – It comes with a few accessories. These include a baking pan, a broiling tray, a crumb tray, a wire rack and also a recipe book. What Do Buyers Say About The Cuisinart TOB-80? Compact Size – Most buyers love its compact size because it is easy to place anywhere on the kitchen counter and costs little space. Easy to Operate – Because its controls are pretty easy to use and the settings are very basic, even reading the manual is not necessary and buyers love it. Toasting – It heats food quickly and smoothly and is very good at toasting. Some buyers even use toast setting to do all operations including warming food. Stiff Knobs – Buyers complained about the knobs because they’re somewhat stiff and not as easy to move as one would like, especially when trying to turn it off after toasting is done. No Minute Options – Like Cuisinart TOP-40, people also complain the timer of TOB-80 because it has no minute options. The ticking sound will still last when it’s off and the sound itself is pretty annoying. the top and the sides of this oven get warm when working. Sometimes the top gets especially hot so don’t put anything cold or flammable near it. Scratches Easily – Although it is strongly built, it scratches easily. You need to carefully use it in case scratch which makes it pretty ugly. Cuisinart TOB-80 Compact Toaster Oven Broiler is a small size, decent capacity oven which provides the owner with four basic functions which include broiling, toasting, warming and baking. If you have a small kitchen counter and you need a decent oven, then this is the one for you. Also, if you live in flats or in hostels and need your food heated quickly, then you can go for this oven.